An aging actress agrees to have her image scanned so that a CGI version of her can be forever frozen in time on the big screen, playing roles that she herself can no longer take, but she comes to regret her decision. That’s the basic premise of this movie and indeed it is a good one. Pretty much every actress over 40 in Hollywood has lamented the lack of opportunities available to them, so clearly this is a real issue. 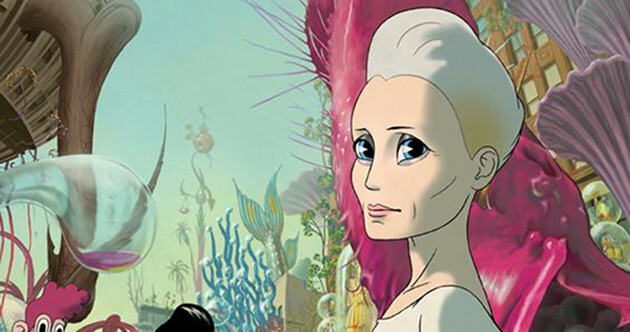 The gorgeous Robin Wright bravely takes on the lead role, playing a parody of herself. While in real life Wright has a hugely successful career, here she is deemed to be past her best, despite having been one of the greatest actresses that ever lived. When her studio Miramount offer her a lucrative contract to be scanned so that they can use her image for the next 20 years, she reluctantly accepts it. However, as she is due to renew her contract two decades later, she attends a Futurological Congress, which showcases Miramount’s latest technology allowing people to transform themselves into animated avatars. They now want to own all rights to her image to infinity, so that people can do what they like with it, and when she rebels she finds herself trapped in an animated world. Separated from her children and unsure of what is real and what is not, she must try to get back to her deaf and blind son before she is stuck there forever. This starts out wonderfully. Wright gives a fantastic performance as the serious artist torn between not wanting to compromise her image, but yet needing to make enough money to look after her kids. Her anguish as she debates the contract is beautiful, and indeed many serious issues about how we view the aging process and judge people’s worth according to it are raised. This in itself would have been enough to carry the film. Unfortunately, when she gets to the Futurological Congress it loses its way somewhat. While the animation is stunning, it tries to cram far too much into this segment, and as a result the story takes many tangents. The dream-like almost trippy sequences seem out of place with the more serious tone of the earlier film, and this section could have been far shorter and still made its point. For such a visual medium the animated segment is an incredibly wordy piece of cinema, and there is a lot of repetition of messages. The first half of this film contains stunning performances, beautiful dialogue and a great story, and is worth seeing just for that. However, the second half loses a lot of the pathos and drama of the first, and feels rather disjointed. While the animation section could have worked, it is simply far too long, and you lose interest in the plot somewhat. This is an interesting piece that is worth a look, but with a few minor changes to the structure, it could have been amazing.